Here is a list of all the postings Harry Twist has made in our forums. Click on a thread name to jump to the thread. Just to add to the above, twas a great weekend, with great company and fabulous flying over the east slope and pier. Thanks to Phil for organising and also to the photographers amongst us for sharing their handiwork. All in all a superb start to the 2019 PSS season! Nice work on the canopies Ade, why three? One spare I assume! Hope to see you at the weekend. 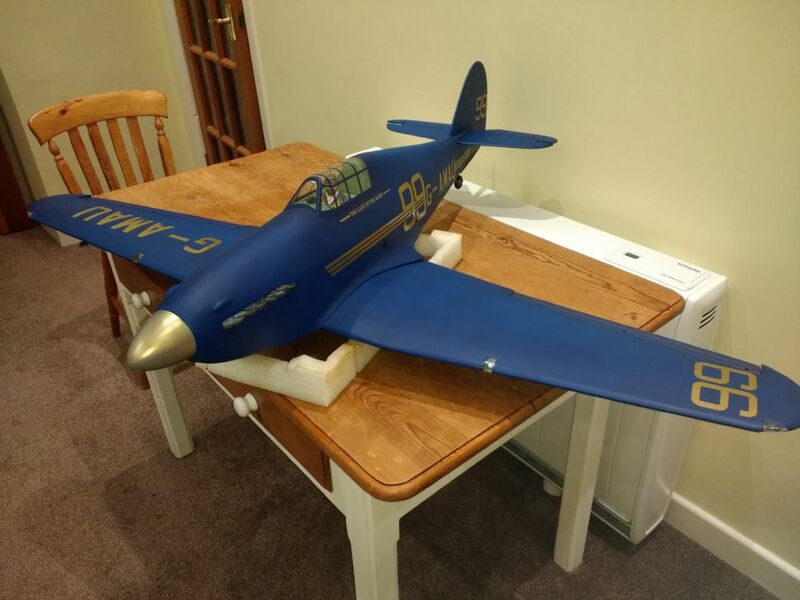 Hi all, Thought I would add some final notes and comments to my build blog for the Hurricane PSS build. 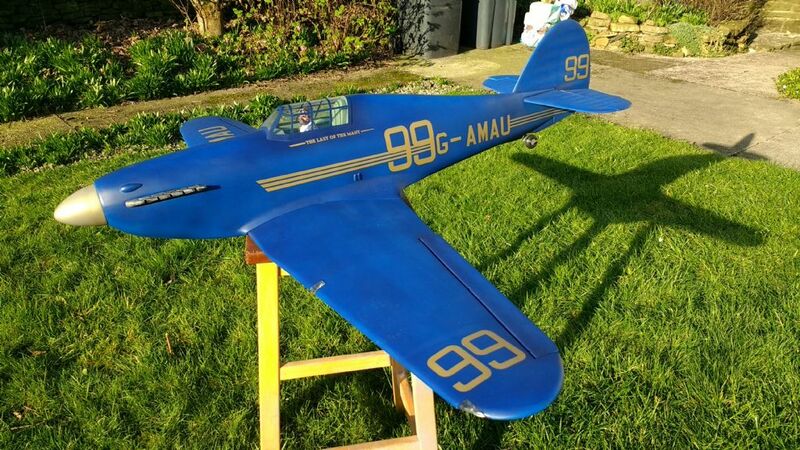 The model did take its maiden flight at the PSS mass build weekend and has also flown a couple of times since. For me I find it an absolute joy in the air, it carries plenty of energy in flight, turns beautifully and flies with a very scale presence and scale speed ( ie not too quick!). The model ended up at a final weight of 3lb 14oz. The paint did finally harden off and is now protected under matt lacquer! The effect of the decals has impressed me, they bring the model to life - the long horizontal stripes were awkward to get right but I'm happy with the result. So for anyone looking to have a go at a PSS build, I would say put the Hurricane on your short list! 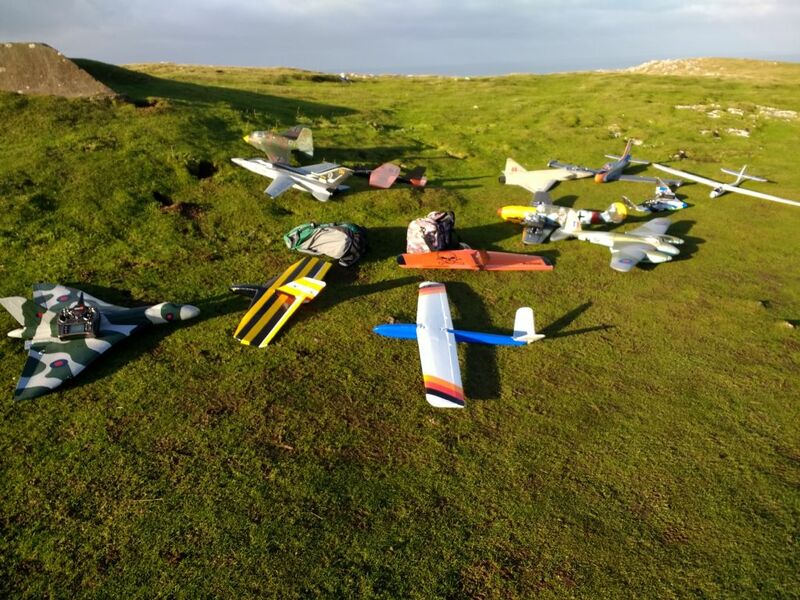 The path is trodden, 21 Hurricanes were successfully maidened in one day, and there's lots of people on here who I'm sure would offer support and help if needed during construction. So finally - many thanks to Matt Jones for the concept and prototyping and to Phil Cooke for leading and driving the project along to its highly successful conclusion. 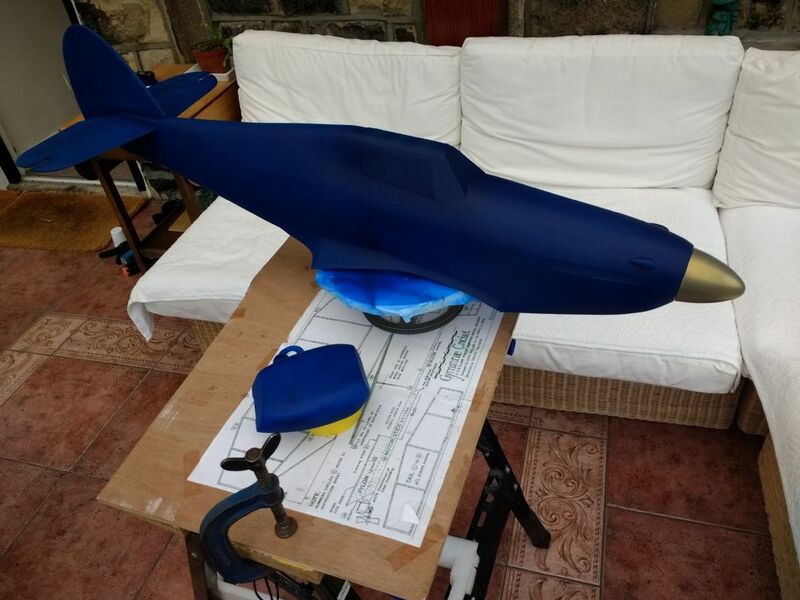 Below are a few photos of the completed model and maiden launch ( credit to Phil Cooke for the two airborne photos and thanks John Hey for the launch!). Fly by - wing lights... just visible! No problems in moving the canopies northwards Adie, the large Tonka's are being produced not far from me! Great idea - count me in! Fabulous flying today, dawn to dusk pretty much, with booming lift throughout, all this plus great company resulted in an excellent way to spend the last day of 2018. Happy New Year to all. Hi All, I'm in ... both days if weather is on our side! Gt Orme or Bosley Cloud fine for me. 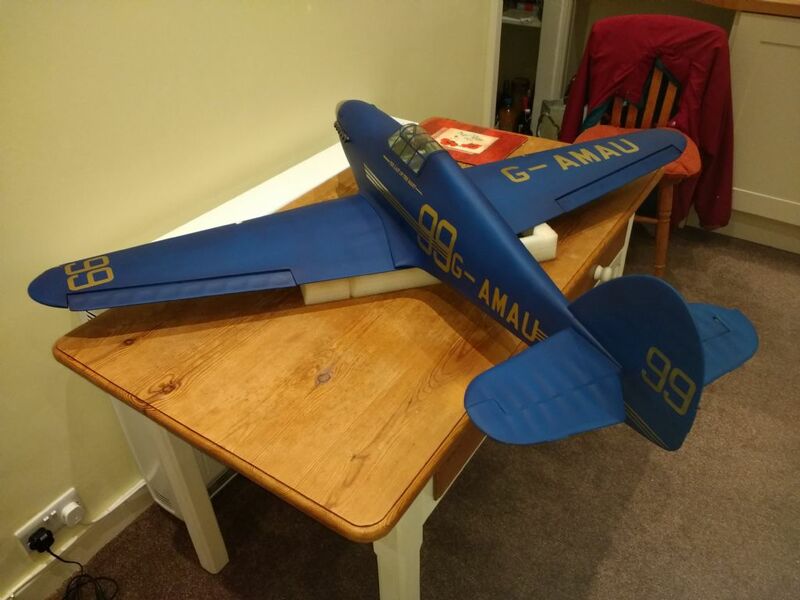 Have a look at the PSSA mass build Hurricane thread, ammonia is used very successfully to achieve some of the shapes in balsa sheet and in longerons. The fumes are powerfully strong - especially directly above any container the ammonia is in, if available wear a face mask/ or painting style respirator, keeping your nose out of the vapours! Use neat and brush liberally over the area required. 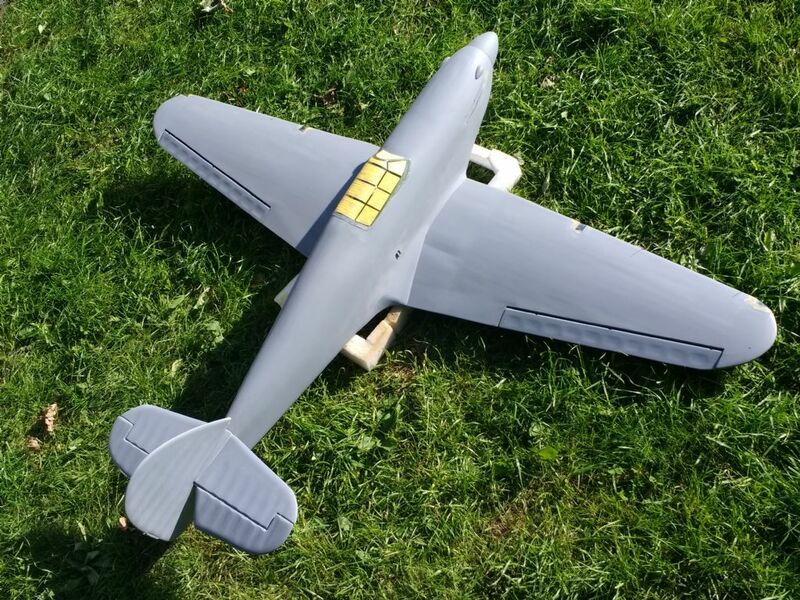 Sounds complex but its quite straightforward and you can get the balsa to comply to surprisingly contorted shapes. 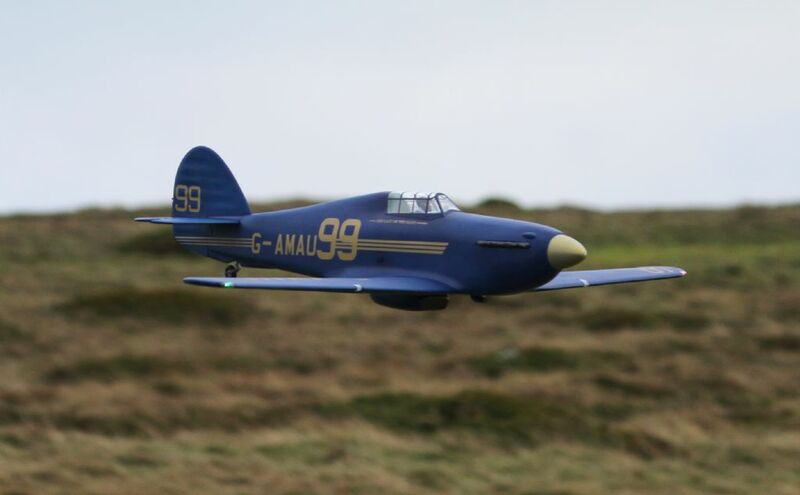 Well done Peter, lovely to hear that your Cranberry is successfully maidened. Sounds like it didnt need much taming - trim wise. A great selection of images there Phil, thanks for sharing. Hi Alan, the Hurricane's looking good. Just to echo Dirk's comment - keep pushing along - your nearly done anyway! Hi All, Just to add to the above post, still on a high from yesterday, what a great day! 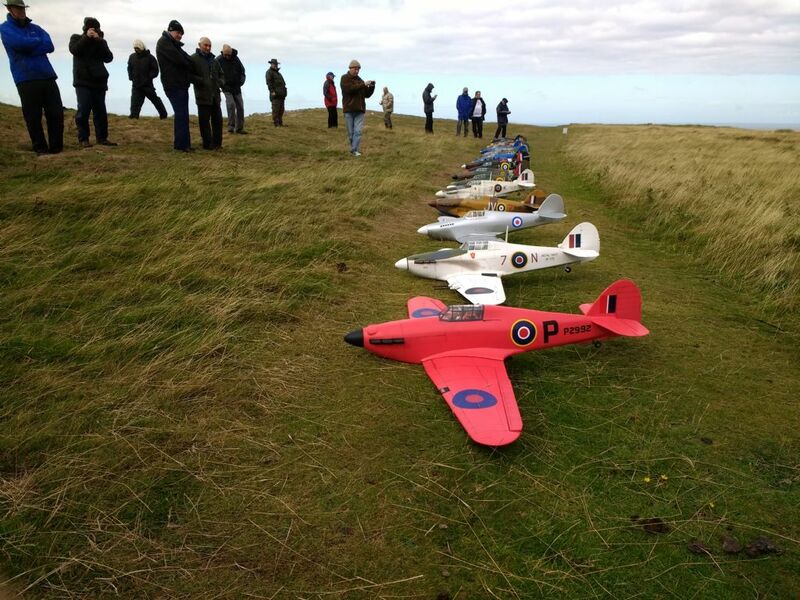 A great event and brilliant to see so many Hurricanes on display in many variants and guises and then see them successfully maidened (20 in all?). It was also a great PSS day in general, with many other impressive models getting an airing. Just to say a big thanks to Phil Cooke for driving the Hurricane mass build project, organising the event and keeping us all coordinated. Even the weather played ball eventually. Also thanks to Matt Jones for the original idea and prototyping. From what I saw, every Hurricane that was maidened flew cleanly, pretty much out of the hand on launch. 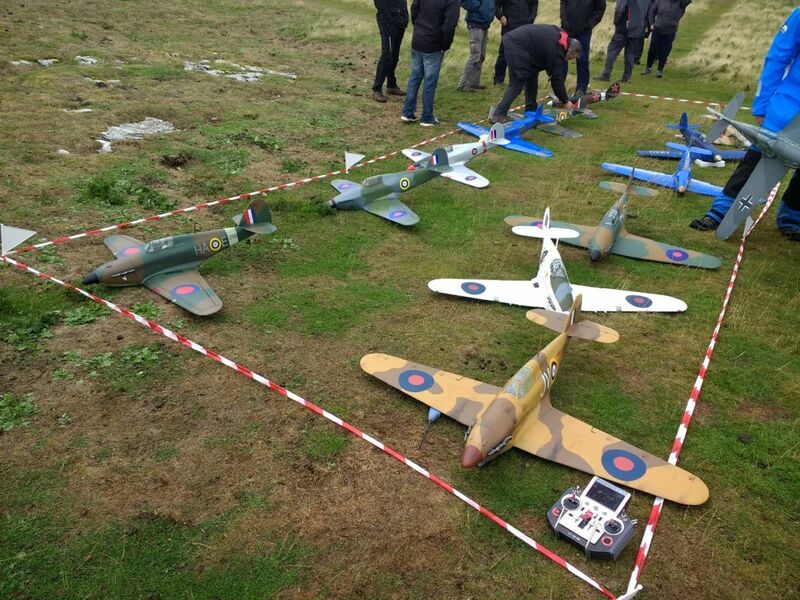 In addition to the flying it was a great social event, sharing ideas and thoughts on construction and finishing of the models. All in all it was a great advert for PSS. Here are a couple of pictures - off my phone so not the best. I'm sure people will pipe in with better images! Phil that's a cracking Hurricane, really well done. 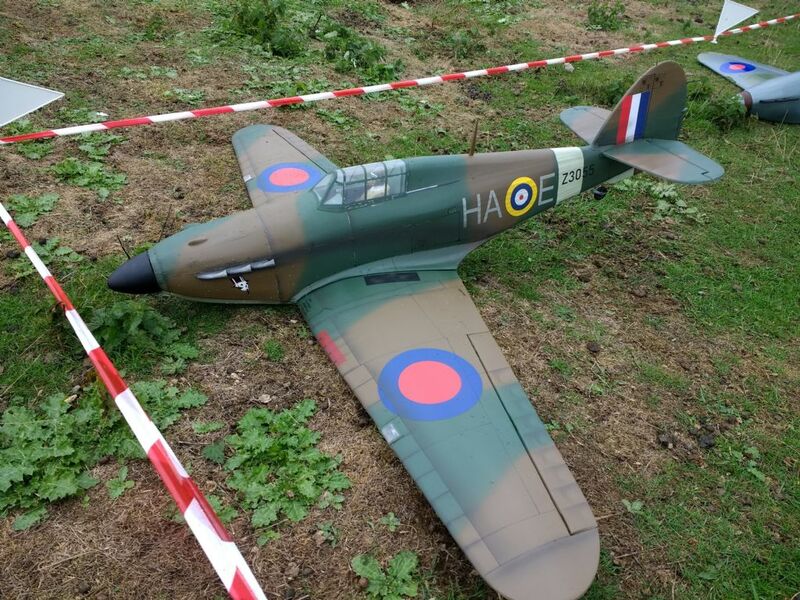 Finished to simulate the last Hurricane ever built, it never saw service but was retained by Hawker at the end of the war. 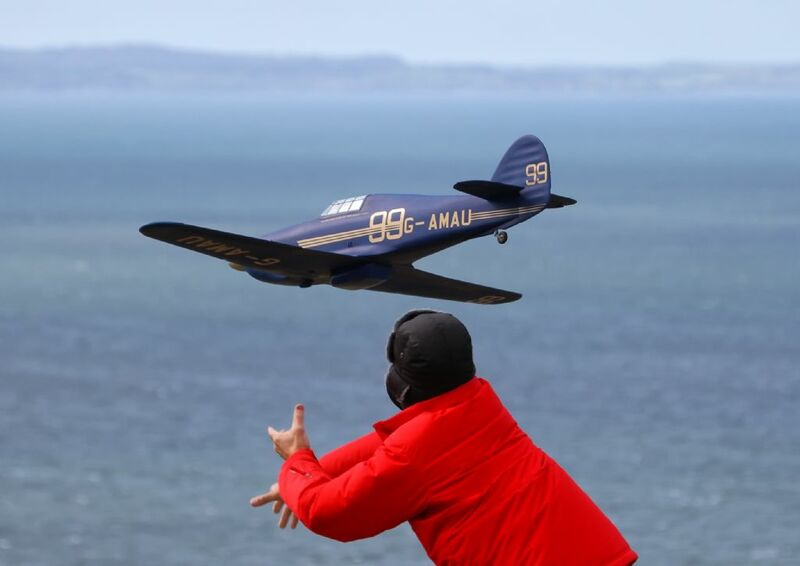 In 1950 it obtained the civilian registration G- AMAU and was used in the Kings Cup air race for a number of years, often flown by Group Captain Peter Townsend. 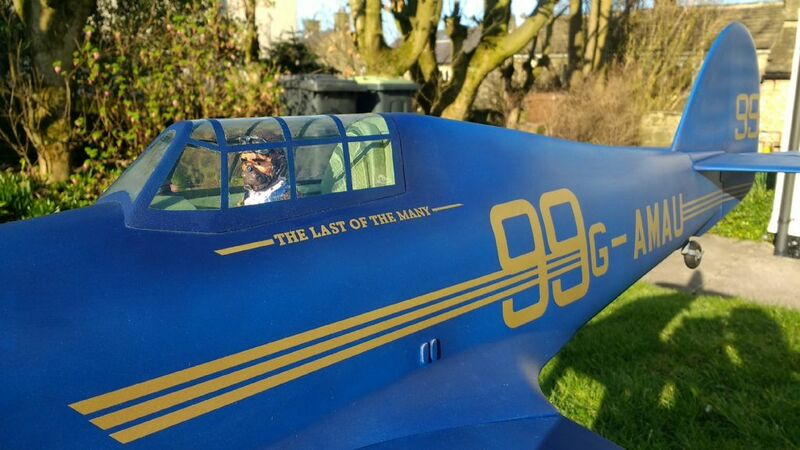 In this guise it was presented in Hawker colours - deep blue with gold lettering. Following refurbishment in 1972 the aircraft was presented to the RAF BBMF and registered as PZ865. The model is glassed all over with 25gsm cloth and airbrushed in Vallejo air paints. Decals are by Callie graphics. 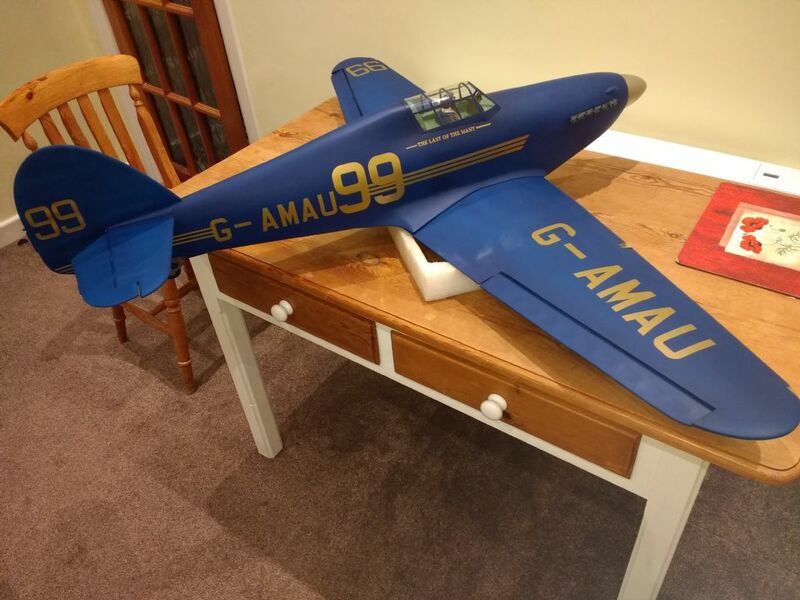 3D printed pats include: 6 port exhaust stubs (Thingiverse), tailwheel ( file from Andy Meade), pilot from Real Model Pilots -self painted. 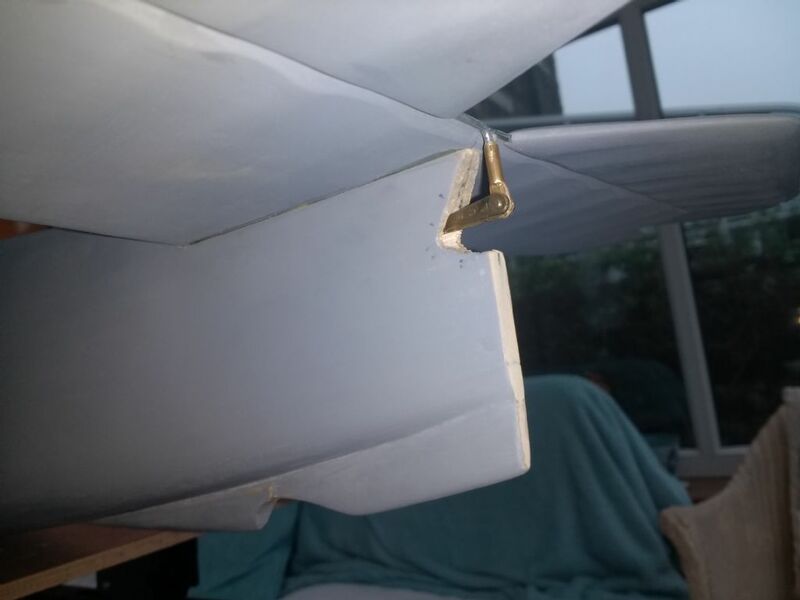 Lights fitted to leading edges and to wing tips. Not sure of final weight yet! Ive not got as far as adding panel lines detail yet, hopefully soon. Hi All, just about there! Painting and decaling all done, wing servos in and I'm calling her pretty much done - just needs balancing and control throws sorting. Paint is taking a while to harden and I'm loathed to over handle the model at the moment. So here are a couple of final pictures to show the finished model. Maybe done for the weekend. In extremis I'll come down Sunday and use Saturday to finish, but trying for Saturday. Hi All, Crikey this is tight! Sorry for radio silence Ive been head down on the Hurricane so thought I had better just get on with it! Must just be me - things seem to take me three times longer than planned! Anyway here's where I am... photos to share. I'll keep on going! Dirk thats stunning - see you at the weekend! Lovely job Andy, I like all the weathering. What weight did she end up at?